SARVER, Pa. (June 1, 2018) - Aaron Reutzel cruised to his second Arctic Cat All Star Circuit of Champions presented by Mobil 1 victory of the 2018 season on Friday night at Lernerville Speedway, leading all but the first two circuits to ink his name on the $5,000 winner’s check. 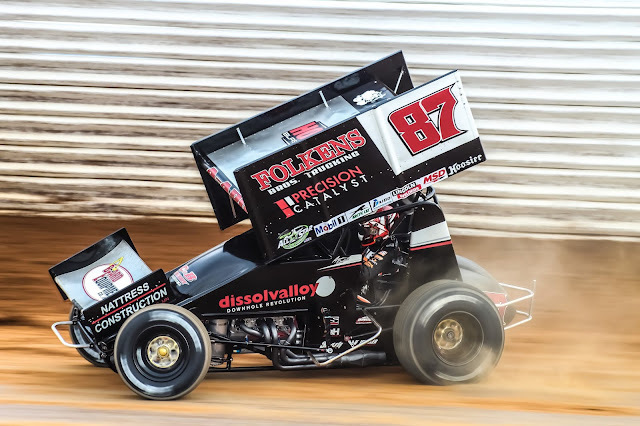 Reutzel, who started second on the feature grid, nearly swept the entire evening program at the Sarver, Pa., 4/10-mile oval, not only recording the fastest time of the night during hot laps and qualifying time trials, but also earning a dash victory. The main event win allowed the Clute, Texas, native to extend his All Star driver championship point lead, now with a 28-point advantage over the “Wild Child” Jac Haudenschild. The “Steel City Outlaw” Tim Shaffer used a late surge to power to second at the final checkers, followed by Parker Price-Miller, Carson Macedo, and defending Series champion, Chad Kemenah. Despite showing the way for the vast majority of the 30-lapper, it was pole sitter, Dave Blaney, who got the early jump, using the bottom line around Lernerville Speedway to lead the first two laps. Wasting little time before making his first, official bid for the top spot, Reutzel chased Blaney for the first two circuits, eventually squeezing underneath the former World of Outlaws champion at the entrance of turn one. The squeeze tactic worked, gaining the top spot to officially lead lap three. Tim Shaffer’s charge to the runner-up spot started from the outside of row four. Strong right from the drop of the initial green, the nearby Aliquippa, Pa., native was solidly inside the top-five just before the midpoint of the 30-lap program, eventually driving around a pair of cars battling for position, Dave Blaney and Jac Haudenschild, to move into second on lap 16. Forced to battle in traffic for the next four circuits, Shaffer and Haudenschild exchanged positions again on lap 20, just before the main event’s third and final caution appeared on lap 21. A sound restart attempt allowed Shaffer to battle back by Haudenschild, and that is where he stayed. Parker Price-Miller also used the evening’s last caution to gain positions in the running order, bouncing ahead from fifth to third by the completion of lap 23. The first two cautions of the main event appeared on the opening circuit and lap nine, respectively. The caution during the opening green involved seven competitors, ultimately forcing a complete restart. The Arctic Cat All Star Circuit of Champions presented by Mobil 1 will conclude their two-race tour of the Keystone State with a stop at Bedford Speedway in Bedford, Pa., on Sunday, June 3. The $5,000-to-win Roy Morral Classic will headline action at the Bedford Fairgrounds half-mile; the first and only appearance by Tony Stewart's All Stars in 2018. Bedford Speedway in Bedford, Pa., will open pit gates at 3 p.m. on Sunday, June 3. A mandatory All Star meeting will take shape at 5:30 p.m., followed by hot laps at 6 p.m. Those seeking additional news and notes regarding the Roy Morral Classic should visit Bedford Speedway on the Web at www.bedfordspeedway.com.